Alright, late last night we teased on Facebook about sharing a story with you of our latest addition “Snoopy.” Who, by the way, is rightfully named after the California native, Snoop Doggy Dogg, AKA Snoop Lion, AKA Snoop Dog. Now, I will warn you, this is a long, crazy story. But I think the best ones always are. In Animal Welfare and in Rescue there is drama. As much as you try to avoid it, stay positive, and focus on the good, the negative will be there. The bad days, they will be there. But our focus, at Lucky 7, is to keep things positive because that is the only way you can continue doing good. We pride ourselves in honesty, we focus on transparency, and we strive to deliver every one of our dogs to their happily ever after, their forever home. 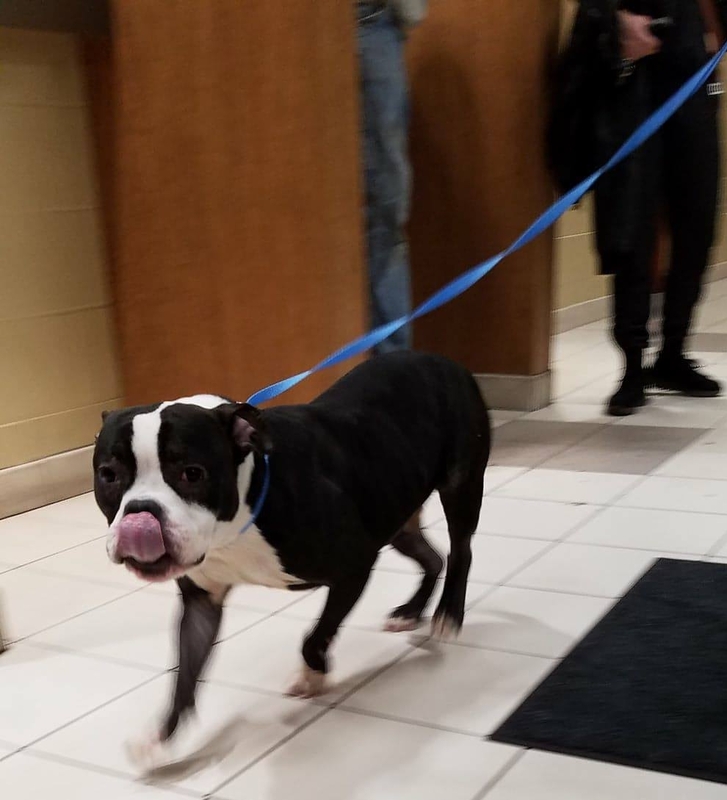 Which is why, two weeks ago, on a Tuesday before Thanksgiving, when we received a phone call from Milwaukee Area Domestic Animal Control Commission (MADACC) we were stunned. One of our dogs, adopted back in May from us, had been brought in, emaciated, as a stray. "How did they know she was yours?" you might ask. Well, luckily, we believe heavily in the power of microchipping and this sweet girl had a microchip that connected her to our rescue. Frantically, we tried to instantly arrange transport to get her back to us. No owner had come forward and after several attempts to contact them and learn more about the story that led to her being brought into a shelter as a stray, we quickly learned that Layla (her previous name will not be revealed in order to protect her previous owner’s privacy) was back in need of a family and lucky for her, she always had a place with Lucky 7. Driving to Milwaukee, the next morning, the day before Thanksgiving, I wracked my brain. Over and over and over again. Searching and wondering “What happened?” “Did we make a mistake?” " I searched for answers in our adoption practices, our policies, and everything that we do because we think it is best for the animals. Everything we do is based off of best practices, off of experience, off of teamwork and positivity. And yet, somehow she ended up in this situation. As I continued to search for answers, I tried to tell myself that everything happens for a reason, that we work as hard as we possibly can and exhaust ourselves to find the best fit for our adopters and our dogs. And so, there must be an answer to our question, “why did this happen?” And then we got to MADACC and we met him, Snoopy. “She came in with another dog, a male, about a year old. Is he yours too?” But he wasn’t. I went into the kennels to reclaim our Layla, and there he was. Leaning against the bars of the kennel, in the cage right next to her. “What’s his name?” I asked. “The staff member looked at his card. “His number is A339316.” The staff explained that he was unfortunately, not a candidate for their adoption program, but luckily, I told her, he was for ours. At Lucky 7, we want to be a place for all dogs, all breeds, all temperaments. If we have a foster for a dog in need, we will take them into our program. We will work with them to find the best possible outcome. We will exhaust trainers, explore resources, and research methods to make a dog as adoptable as possible. Luckily, being a foster and volunteer based rescue allows us to focus on helping specific dogs at a specific time. We are able to tailor the amount of dogs we have in our program so we can dedicate every resource to helping them in the exact ways that they need. This means that through teamwork with MADACC, we are able to give Snoopy additional resources to succeed and once his stray hold was up and no owners reclaimed him either, we could transfer him to us. One of the obstacles that made Snoopy and unadoptable dog at another organization, was his fear based reactivity towards other dogs in a shelter environment. This is a common occurrence in many shelter environments. Dedicated staff try to make a shelter as inviting, stress free and comfortable as possible, but the noise, the other animals, and the lack of consistent handlers will naturally create stress. In Snoopy's case, his stress caused him to act out towards other dogs. This meant that in order to create a successful program for him, we needed to find him a pet-less foster who could dedicate time to learning his behavior and potential triggers. But we didn’t have a pet-less foster. Seeing him in the kennel next to Layla, and knowing that he came in with one of our dogs, instantly made him apart of the family, and giving up on him was not an option. The day before Snoopy’s time would have been up at the shelter, our amazing Transfer Supervisor, Sara, found the perfect match. A one man, no pet, awesome foster, who could focus all attentions on creating an adoptable dog in Snoopy. And we were one step closer to fate. Meanwhile, Layla was completely immersed in her foster home and showing off all of her lap dog (she is NOT a lap dog) skills. Her sweet, sensitive, affectionate, and honestly perfect personality stole the heart of one of our volunteers, Brooke, who didn’t even know she was looking for another dog. We did a playdate with Brooke’s resident dog and Layla the exact same day we found a foster for Snoopy, and everyone knew it was meant to be. Layla was home, again, and for good. Now, it was Snoopy’s turn. From day one of Lucky 7, we have been blessed. We have been fated with volunteers walking into our organization at the exact time they were needed. We have been fated with things working out that were never meant to, of partnerships and organizations coming together to save dogs in need. Since day one, when we jumped in a Jeep and drove across the country to save seven helpless puppies (taking a wrong turn towards Indiana and getting rear ended in Arkansas), fate has been on our side; testing us and pushing us towards a better version of ourselves and towards the best possible rescue we can be. Yesterday, A339316 got a name. Today, Snoopy slept in, wrapped in blankets, with his foster dad. Today, Snoopy got a bath, and new toys, and a collar of his own. I warned you, this was a long story. But it’s not over yet, Snoopy’s journey is just beginning, and ours, as always, is continuing.